Creating a books, parts, chapters, and scenes extends your Manuscript and creates a new content that you can edit. To create any content you can click the + symbol under the search bar to the right, then select the intended content. The new content item will be placed in the first available place within or after the selected item in the navigation. 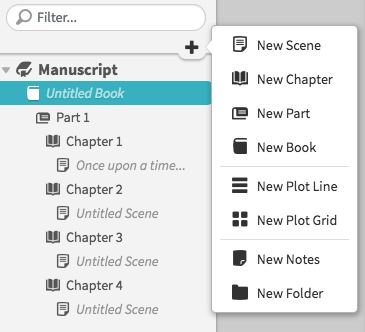 Only scenes can go in chapters, so if you create a new plot line while a chapter is selected, it will be placed in the plotting section or in story notes.